29 1/2 x 21 1/2 inches, Signed and dated lower left: "Theodoros Stamos '46"
Theodoros Stamos: Contemplations on the Universal at Hollis Taggart Galleries turns a retrospective eye on the remarkable career of Theodoros Stamos, whose transcendent paintings rise above his roots in first-generation Abstract Expressionism to convey universal truths about nature and the cosmos. The selected works range from the late 1940s through the 1980s, punctuated by tight groups of biomorphic abstractions from 1949 and luminous color fields from the late 1970s. This exhibition reveals Stamos as an artist of great introspection, intellect, and originality whose work deserves wider appreciation. Stamos spent the latter half of his career living for most of each year in Greece, his ancestral homeland, where he developed a deep connection to the landscape and to the robust tradition of classical myth, connections that manifest poignantly in his work. During these years he was largely supported by European collectors who built an abiding kinship with both the artist and his work. Several paintings in this exhibition come from these European collections and have never before been shown in the United States. 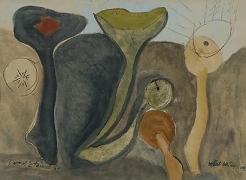 Achieving critical and commercial acclaim at an early age, Stamos was the youngest amongst the first generation of the New York School and was awarded his first one-man show by Betty Parsons at the age of just twenty-one. A somewhat elusive figure, his art was shaped by an affinity with nature and an ability to manipulate color and form with great subtlety and suggestion. Stamos’ abstract canvases offer emotionally evocative records of his travels and interactions with nature. The works speak in a language of tension and balance, their appeal stems from their striking visual embodiment of the particularities of light, time, mood and place. It is here that Stamos’ command of paint lies, in his ability to visualize human emotional and sensory relation to place, and as such, his experience of the world. Theodoros Stamos: Contemplations on the Universal will be accompanied by a fully illustrated catalogue including a new essay by noted curator and art historian Jeffrey Grove. Grove’s recent publications include Michaël Borremans: As Sweet as It Gets, published in conjunction with an exhibition at the Dallas Museum of Art and the Centre for Fine Arts, Brussels; Isa Genzken: Retrospective, published on the occasion of an exhibition at the Museum of Contemporary Art, Chicago, the Dallas Museum of Art, and New York’s Museum of Modern Art; and Jim Hodges: Give More Than You Take, published in conjunction with an exhibition at the Dallas Museum of Art and the Walker Art Center. Grove is currently an independent curator and has previously served as the Senior Curator of Contemporary Art at the Dallas Museum of Art and as a curator at Atlanta’s High Museum.